Today in this tutorial i let you now how you can Transfer or Move Google chrome bookmarks from one computer to another in easy and simple way. Usually when you login to new computer or bought the new computer and want to use your saved Google chrome bookmarks on the same. You can do this simply without using any third party addon and use your old bookmarks into new computer easily. There are so many application are available on the internet which helps you do the same. But with this method you can carry your bookmarks with yourself and use it on any computer. Now you are on the Google Chrome Bookmanager page, from here you can import and exports bookmarks from your desktop. 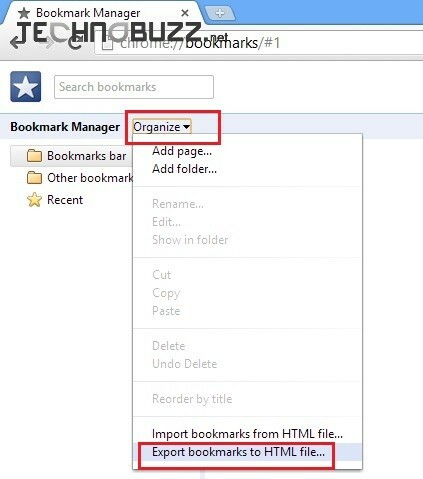 To save the bookmarks on the desktop click on the oRganize button from the bookmarks manager toolbar and hit the ‘Export bookamarks to HTML file‘ and save the file on your desktop. Now the file is saved on your desktop, from here you can mail them to your inbox or save them into your USB drive. To import the saved bookmarks on the new computer all you have to Select the import Bookmarks from bookmarks manager and browse the saved file. With this way you can bring your bookmarks over to a new computer. Second Method – Sign in to Google Chrome :- Another easy way to transfer bookmarks are Sign in Google chrome with your Gmail Login ID. Just sign in when you use the Google chrome browser. That way, whenever you’re signed into Chrome on any machine, your bookmarks will travel with you. To do this go to the Google Chrome settings page or use this URL chrome://settings/ on your browser. Now on the settings page you can see the sing in option. When you sign in to the Chrome browser or a Chrome device, your bookmarks, extensions, apps, theme, and other browser preferences are saved and synced to your Google Account. You can then load these settings anytime you use Chrome on other computers and devices. This one is the one of the best and easiest way to carry all Google chrome setting with yourself. Yes, but what about saves passwords?? and I dont want to sign into Google – ever.. why not make the effort and rather than cut and paste all the other articles that are out there actually make a useful one..